Summer is officially over and all the children are back in school, learning the three R’s and reading, hopefully, diverse literature. In this “Back to School” themed post of Flashback in Color, I’d like to reminisce on the book that opened my eyes to using YA literature in the classroom, Sharon Draper’s first book in the Hazelwood High Trilogy, Tears of a Tiger. I was introduced to this book during my first year of teaching when I was struggling with my sophomore students. My principal at the time suggested that instead of using the literature book, which was boring to the students (and to me, I must admit), that why don’t I have them read a novel that will relate to their lives and be of interest of them. He pulled out a copy of the book, handed it to me to read over the weekend, which I actually read in about 2 hours. It was just that intense and such a good read that the minute I put it down, I was already planning how to tie the book to my curriculum. The unit ended up being a success as my boys (I was at an all boys school) connect to the book, loved it in fact, and couldn’t wait to discuss the novel in class. Many students read it all in one sitting. Teaching Tears of a Tiger opened my eyes to Young Adult literature beyond Harry Potter (all I had read at that point) and what a powerful tool YA literature can be in the classroom. Ever since then, I have incorporated YA literature in all of my units, allowing for students to connect to the stories and be able to discuss issues that are important to them. While I have not taught Tears of a Tiger in a number of years, I still recommend it to students, specifically my young men, and actually teach another one of Sharon Draper’s novels. Her novels accurately portray the teenage voice (Ms. Draper was a teacher herself) and deals with issues that teenagers face in high school. Draper doesn’t sugarcoat the lives of her characters, often being very frank and descriptive in the violence and/or the tragedies they face. Tears of a Tiger is one such book that explores the tragic consequences of drinking and driving. In the novel, Andy Jackson is a star basketball player and one night after a game, he and a few friends decide to drink and drive. They ultimately crash and his best friend Robert is burned alive when the car catches fire. The rest of the novel deals with Andy’s guilt and the effects of the crash in his relationships, school work, and overall outlook on life. Draper uses a variety of methods, from newspaper clippings to school essays, to tell Andy’s story. The novel moves at a fast pace as you read about Andy’s downward spiral into depression. 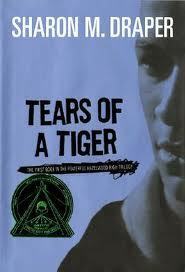 Tears of a Tiger is a touching story that made my heart race at points and brought tears at others. I can tell you that middle school boys and high school sophomores highly recommend this book. Buy one for them, they will thank you for it. Wow! This book sounds awesome!! !